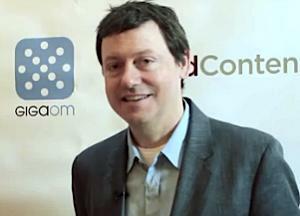 Union Square Ventures managing partner Fred Wilson has a pretty hot hand when it comes to investing in the social web, with stakes in leaders such as Twitter and Tumblr, but he hasn’t put money into anything that looks like a media company for some time. In an interview backstage following our chat at the recent paidContent 2012 conference in New York, I asked Wilson why that is, and he said it comes down to a number of factors: one is a lack of familiarity with the media business, but the other is a concern that traditional media companies don’t scale well — particularly when compared to user-generated content such as Twitter. Wilson said that Union Square took one crack at something approaching the traditional media or content business by investing in Outside.in, which aggregated local data from a variety of sources. “We took a shot at the hyperlocal content business through a blog-aggregation model with Outside.in and that didn’t scale very well,” he said. “I think that hyperlocal media model is still one that has not been cracked.” Outside.in was ultimately acquired by AOL (s aol) last year and folded into its Patch.com hyperlocal effort, which has also gotten a lot of criticism from investors and analysts for being a high-cost operation. I don’t think the idea is that the editorial function or the venture capital function or the journalist function doesn’t happen any more, we just have to do them in the new place that they should be done, the more efficient place that they should be done. Embedded below is a video of the on-stage interview I did with Wilson, in which he discussed the tech industry’s response to SOPA and PIPA — and how he believes that content owners have a public duty to provide access to their content in a variety of ways, because society helps enforce the copyright that they hold over that content. Doesn’t he have money in BusinessInsider?